Joe Littlewood from Nviron is interviewed by James Hulse of Dell EMC for the latest #channeltalks series. James Hulse of Dell EMC speaks to Joe Littlewood, Sales Director of Nviron the latest Dell EMC #ChannelTalks series. 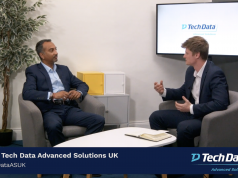 Dell EMC are the providers of technology solutions, services and support and this series James interviews a range of experts from within the technology industry. Next articleIs Active Directory On Its Way Out?